The Mini-Mag is the world's smallest duck call for a reason! Its compact design locates air pressure closer to a special "free-floating" double reed. Mighty Predator MP3 with Speaker . The only thing that could make our MP3 caller any better was to add an external speaker, so we did! Now, with a high quality bell housed speaker and an additional 50' cord to get those sounds out and away from your location. Predator Call = Coyote Dog Howler. Makes all the coyote vocalizations, including yelps, howls, barks and whines. Also produces squalls to call mountain lion, fox, bear, bobcat and other predators. Works any time of the year. Predator Call = Crit'r Distress. 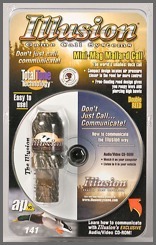 Pocket size call imitates the distress sound of rabbit, raccoon, and deer. Great for coyote, fox, bobcat and bear. Predator Call = Pitch Controlled Predator Call. The perfect call for producing rabbit distress sounds and “close-in” squeaks. Pitch can be controlled by biting voice channels together. Predator Call = Rabbit Distress Predator Call. To attract the immediate attention of bobcats, foxes, coyotes, and raccoons, this long-range cottontail rabbit predator mouth call is just the ticket. Our number one selling predator decoy has been refined and updated to make it better than ever. Change of seasons, change of cover!